I became interested in Just Treatment when I read about their campaigning to keep secondary breast cancer drugs available on the NHS. These often pioneering drugs are increasingly either in danger of being taken out of the system, or of being rejected by NICE before making it into the system, purely on the basis of their prohibitive cost. I’m a secondary breast cancer patient myself, and am currently on pretty mainstream maintenance drugs which are available to all on the NHS. I am very fortunate in that I haven’t been directly touched by the high prices of medicines - yet. Sadly, I’ve realised that everybody’s experience of cancer treatment isn’t the same as mine. Through my involvement with online cancer groups and hearing anecdotes from others elsewhere in the country, I know that the postcode lottery is alive and kicking. From three month waits for results for some, when my own scares were answered in two weeks, to the availability of a BCN (breast cancer nurse) to provide a communication between me and the oncologist and surgeon and to generally hold my hand through treatment and beyond. Every breast cancer patient is supposed to be allocated a BCN, but I know this isn't always the case. Patchy treatment might not seem the same issue as that of high medicine prices but I feel the two are closely related. The NHS is no magic porridge pot: every time we overspend in one area, it has a knock-on effect on another. Despite my strength of feeling about this, initially I didn’t rush to sign the petitions but found myself all-consumed with the ethical question: if there isn’t enough money to provide every treatment to every patient, how on earth do we choose? And I thought we had to choose because the NHS wasn’t a bottomless money pit. I thought I understood that this issue wasn’t as simple as the drug companies charging an exorbitant cost per medicine, because they had to cover their research and development costs. In short, I thought that if we demanded the large pharmaceutical companies drastically cut their current prices, this would inhibit their ability to research and develop game-changing drugs in the future. As we’d all pray for medicines to turn terminal diagnoses into treatable diseases, I thought we had to pay high prices to make sure these big pharmaceutical companies stayed in business. But here’s the thing. I’ve since learnt that the profits these companies make far exceed the amounts needed to cover their costs, and that includes the research and development of new drugs. Even more disappointingly, it would appear that much of the research and development they claim needs funding is actually being done by publicly funded institutions - so we are paying twice. And of course, we're not just losing out financially. I’ve learnt that the pharmaceutical companies could still provide medicines, invest in and carry out research and development, make a tidy profit and keep people in jobs, without charging so much that the NHS has to make devastating choices about which medicines can be funded, and which can't. We need to address the monopoly issue which enables drug companies to hike up prices so that they bear no resemblance to the actual cost of researching, developing and manufacturing drugs. Tackling this would benefit the NHS as a whole, as well as enabling wholesale provision of life-saving and life-lengthening drugs to all who could benefit from them. I’ve realised that directly, or indirectly, every single one of us would benefit from cheaper prices and yes, new medicines would still be discovered at the fastest possible rate. That is why I want to be involved with Just Treatment. I want other people to know that this is a fight worth fighting and, apart from slightly lower dividends for the pharmaceutical shareholders, there aren’t really any losers if we win. 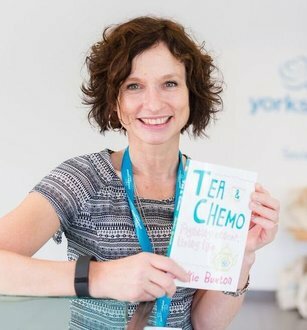 Jackie's book Tea and Chemo is available to buy from various retailers - you can find out more on her blog and buy the book by clicking here.